Below are Gene Autry guitars and related items for sale. They might be a standard sized guitar (in varying styles and sizes and made by a variety of manufacturers), a child's toy (again, these were made in different styles and sizes by varying manufacturers), a photo of Gene Autry with a guitar, guitar sheet music, or other items. While many Gene Autry guitars were manufactured many years ago, some of the guitars may be very recent models. Below: Gene Autry smiling in a 1960 publicity photo. 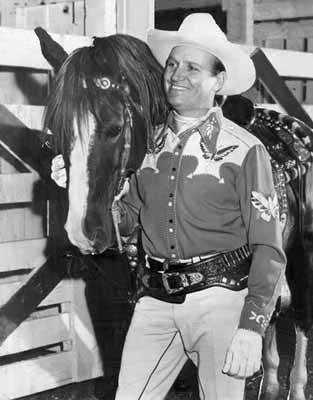 Below: Gene Autry and his famous horse Champion. 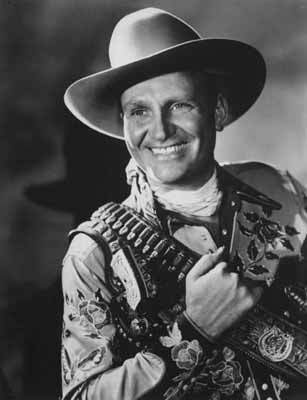 Gene Autry (Orvon Gene Autry, September 29, 1907 - October 2, 1998) rose to American superstardom in the the 1930s, 1940s, and 1950s with phenomenally successful careers in singing, song writing, and acting. Known as one of the entertainment industry's most popular singing cowboys and cowboy actors, he shared his fame with his two most famous and constant companions: His horse Champion, and his guitar. When buying a Gene Autry guitar on eBay or anywhere else, here are a few good things to know before you buy. How old is the guitar? While a few of the Gene Autry guitars for sale on eBay have been manufactured recently, most of the guitars were made many years ago, sometimes dating back to the early 1930's. What kind of a guitar is it? Is is a standard sized guitar, or it a child's toy? Does the Gene Autry guitar come with a box or guitar case? If so, is the box or case the original one that came with the guitar, or a different one? Since most of the Gene Autry guitars for sale on eBay were made many years ago, it is reasonable to assume they may not be in perfect condition. Does the seller describe the guitar's flaws or blemishes in detail, and also show them in pictures? Speaking of pictures, how many pictures are there of the guitar? Good sellers provide several clear, sharp pictures in good lighting of the items they are selling. If a seller does not provide enough pictures of good enough quality for you to get a good look at the guitar, email them and ask them for addition photos before you bid or buy. If the seller is unwilling (or claims they are unable) to provide good photographs, approach purchasing a Gene Autry guitar or any other item from that seller with extra caution. If the seller claims the guitar is an antique or a collectible, do they provide any information to back up theses claims? If the seller claims that the guitar was signed by Gene Autry, be sure you know exactly how they define the word "signed." In many cases, a "signed" Gene Autry guitar does not mean the guitar was personally signed by Mr. Autry. It may mean the guitar was manufactured with the signature built in. Every eBay item for sale has a "Seller info" area. Be sure to check this area to view the feedback rating that previous buyers have left for that particular seller. There is also an area where a potential buyer can read comments left by previous buyers. How much will the shipping be? Will the seller ship to your location? Is shipping insurance required or optional? How soon will the seller ship your guitar after it has been paid for? What forms of payment does the seller accept? How soon do you have to pay for your purchase? An increasing number of eBay sellers are getting tired of buyers who take a long time to pay for their item. Some of these sellers are now requiring the item be paid for within a certain time frame or the sale is off. Read the item's description for acceptable payment times and terms. If you have any questions about a Gene Autry guitar for sale on eBay be sure to contact the seller and ask any questions before you bid or buy.